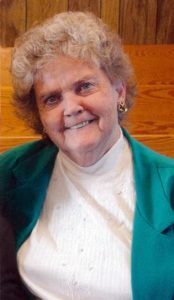 On May 12, 2017, Glenna Rae Woods went to be with the One she loved most, her Lord and Savior, Jesus Christ. Visitation will be Thursday, May 18, 2017 from 3 to 8 p.m., at Ward Funeral Home in Washington. Glenna was born November 3, 1944 in Leavenworth, Kansas to Shelby Loren Weigel Sr. and Edith Mabel Davis. She attended Bible School in Kansas City and later moved to Morehead, North Carolina. She married Rev. Walter Holt Woods in Florence, North Carolina on October 15, 1978. They ministered in North Carolina until moving to Haddam Kansas in August of 199 1to pastor the Haddam Church of God of Prophecy. Walter and Glenna were both co-pastors of the Church until Walter’s death on April 27, 2006. Glenna then took over as pastor until her death. Glenna is survived by her “adopted kids” as she referred to them, Richard and Cindy Nye; her siblings Ann Hoffman, Haddam; Vicki (Noel) Lyons, Emporia, KS: Carrie Stettler and brother George Edward Weigel, Kansas City, MO: Edith Sue (Donnie) Nichols, Topeka, KS; Linda (Jerry) Nichols, Gardner, KS, any many nieces and nephews. Glenna was preceded in death by her parents and husband and brothers Shelby Loren Weigel, Jr. and infant brother Garrett Weigel. Memorials may be made to the Haddam Church of God of Prophecy and sent in care of Ward Funeral Home.